you try, the worse your putting gets. More effort with less result. You must learn to play down the importance of a putt by focusing on the process rather than the result. Treat every putt as just another putt. It is a fault that afflicts both pros and amateurs. They get so focused on the outcome of each putt that they invariably mess up. Golf is full of contradictions. You hit down on the ball to make it rise. The more you try to counteract a slice by aiming left, the greater your slice becomes. And putting is no exception to this contradiction. You would expect that taking extra care over a putt, would improve the chances that you hole it. In fact, the longer you take over a putt, the more likely it is that you will miss it. Golf is much easier to enjoy when you have no expectations of yourself. Self-imposed pressure to succeed and the weight of expectations of others undermine what ability you have. No-one likes to miss a short putt, but we all do. It is often because we don't want to embarrass ourselves in front of our playing group and as a consequence tense up. Every putt should be a single event - the one shot at a time idea. It is also important that you don't label your putts. For example, I need this putt to break 90 or make a par. It is difficult not to do, but it places the focus on the outcome rather than the process of executing a smooth stroke. Many golfers sink practically everything on the practice putting green, but fail to take this form on to the course. It is not because they have forgotten how to putt. The main reason is that they try too hard to succeed. In other words they play a different game. The question is: How do you get out of your own way when putting? According to Bob Rotella in conversation with Brad Faxon the secret is in the attitude you adopt when you putt. You have to have a playful attitude that this is a game and not care if you miss. You have to develop a real love affair with putting. Watch the great putters of the game. They don't appear to agonise over a putt. When they miss, and everyone misses no matter how good you are, they accept the result and move on. They don't allow a missed putt to influence their subsequent play. As Seve Ballesteros remarked that to be a good golfer you must suffer from instant amnesia. 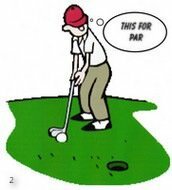 Missed putt – what missed putt? If you stew over the past, it will affect the future. It is easy to get down on yourself when the ball doesn't roll for you. However, bemoaning your misfortune wins you no friends. The one truth about golf, and by extension putting, is that no-one is really that interested in your game. So the secret to achieving better results boils down to working harder to try less. You need to get to grips with this Putting Contradiction and quit adding pressure on yourself. Learn how to play down the importance of a putt. Trust your first instincts and treating putting as a challenge to be enjoyed. Don't become another victim of the Putting Contradiction.